A hearty and satisfying bowl of steel cut oats are sweetened naturally with juicy strawberries and ripe bananas. Steel cut oats remind me of my childhood. My mommy made them for us regularly and I always loved the chewy texture and nutty flavor that you simply don’t get from old fashioned oats. Don’t get me wrong, I love my old fashioned oats but every now and again I crave a hearty, satisfying bowl of chewy steel cut oats. One note: steel cut oats are not nutritionally superior to old fashioned or quick cooking oats. 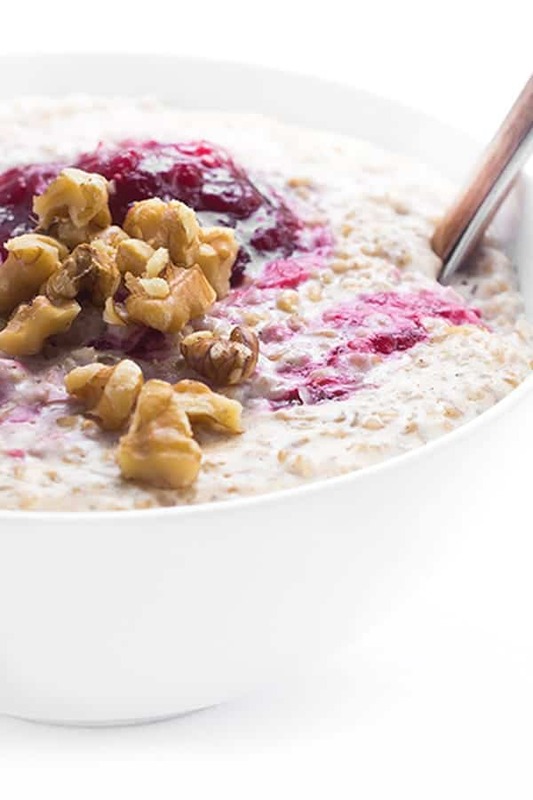 They are simply less processed because they are not rolled flat (into rolled oats) and they are not chopped into smaller, faster cooking pieces like quick-cooking oats. An oat is an oat is an oat. Protein Packed: 20% of the calories from chia seeds are from protein – a much higher amount than most grains such as wheat and rice. Protein takes longer to digest which keeps you fuller longer and gives you lasting energy. Boost Brain Function: Chia seeds contain a good dose of EFA’s (essential fatty acids) which have been shown to boost memory and improve concentration. Energy Boosting: The word “chia” means strength in the Mayan language which makes sense because the natural combination of protein, fiber and carbohydrates found in chia seeds will give you the fuel you’ll need all day long. This is the reason chia seeds are so popular in the running community. Rich in Omega-3’s: We all know that fatty fish like salmon is an excellent source of omega-3’s but what if you’re not a fan? Chia is an excellent alternative and in fact, is the highest plant-based source of omega-3 fatty acids! Bring water, salt and cinnamon to a boil then stir in steel cut oats. Reduce heat and simmer until liquid is absorbed, about 15 minutes. Five minutes prior to the end of cooking time, stir in flax seed meal, chia seeds, chopped walnuts, banana and strawberry slices. Cook until liquid is absorbed then divide evenly between four bowls to serve. This dish is naturally dairy free and vegan. To make it gluten free be sure to use GF oats. Thanks Crystal – I hope you get to try it! I love every bite of this, Liz! I’ve become such a fan of chia seeds and oatmeal is my go-to breakfast. Now that strawberries have appeared I can’t wait to make your lovely version! Isn’t strawberry season the best?!?! You will love the added crunch! You know as a child I use to hate chia seeds, in summer my grandmom use to soak them and then make very cooling drink … Trust me I use to run away. But Now I love them. This looks fabulous….. Totally right up my alley. This looks incredible! I’m always on the hunt for new ways to work chia seeds into a meal. Thanks for the inspiration! Confession: I have not yet jumped on the chia seed bandwagon. But I really should, because they sound great, especially here in this tasty-looking oatmeal. What a fantastic way to kick of the day! It’s never too late to start!! They always make me feel fuller when I add them in! 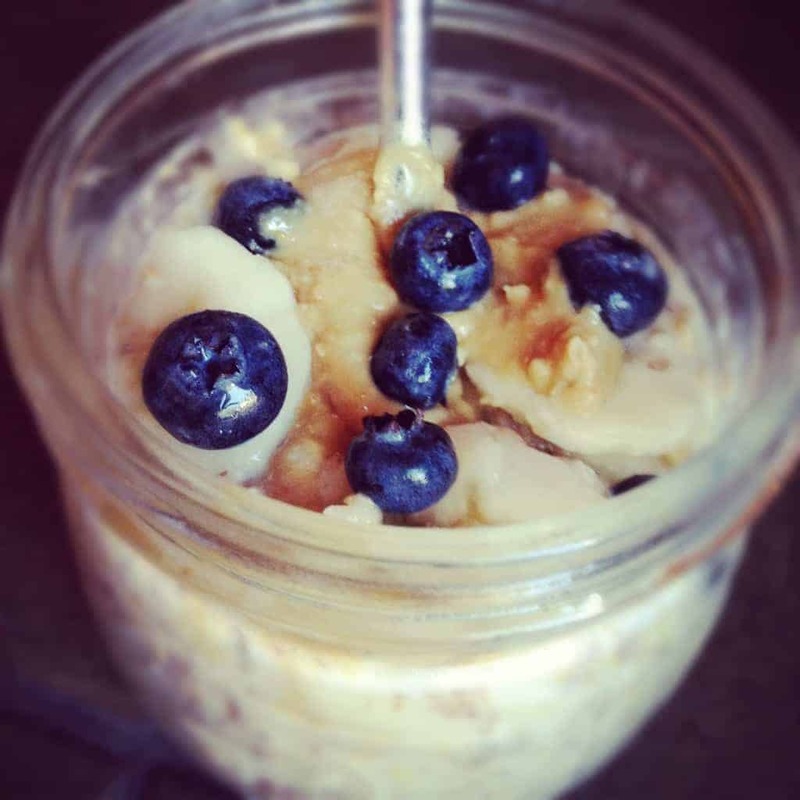 Great oatmeal recipe! I love steel cut oats. I also LOVE strawberries and am sick of paying so much for them and them not tasting great…can’t wait for strawberry season, or berry season for that matter! Oh man I am so ready too!!! We just bought a huge vat of them from Costco. YAY! Here’s a recipe where I have all of the ingredients in the house! I am a big fan of steel cut oats, and this looks like a winner. Thanks! I love when that happens!! Enjoy! OK, I think I can actually do this! I’ve always been nervous to ever try steel cut oats!! You can so do this!!! They honestly take less time to cook than you would think! And add whatever fruit you have – we also love apples, pears, pumpkin, anything really! This looks so pretty, and I love the flavor combo of strawberries and bananas. 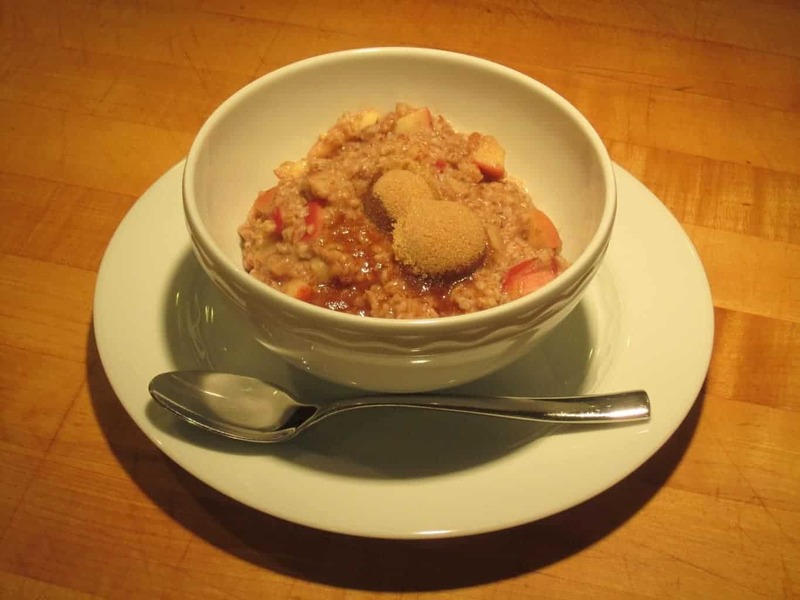 Oh wow – I am always looking for tasty things to do with Steel Cut Oats. Love this recipe! I love steel cut oats! Over the last couple years I’ve been eating them more because I started buying a huge bag of Coach’s Oats from Costco & you can easily cook in microwave. Chia seeds rock! I need to start making in the microwave more often!!! I can’t believe it, but I’ve yet to jump on the chia seed bandwagon. I had a bad experience a few years back I haven’t tried it since. Maybe I should give that AND your oatmeal a try. I’m sure I can’t go wrong there. Oh no a bad experience?? Well I vote give them another shot!! Such a great source of protein for a busy mama like you! Yum! I love this combination and I love how healthy it is! 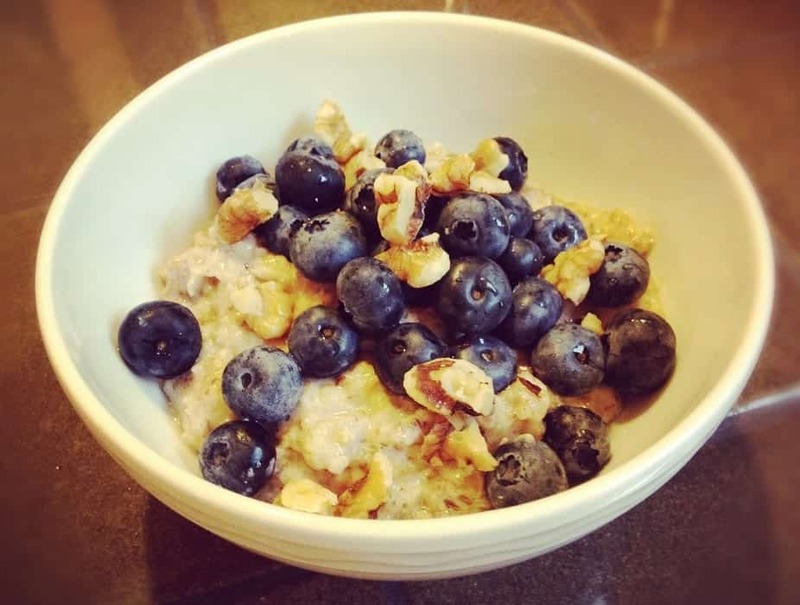 I love, love, love steel cut oats! But I have yet to try chia seeds, thanks for the great idea to test them out! They are crunchy and addictive – perfect to add into anything! I hope you love them as much as we do. Awww Bob. I heart him. Yum, what a great breakfast – I bet your son devoured this! Of course he did. ;-) How did you know? 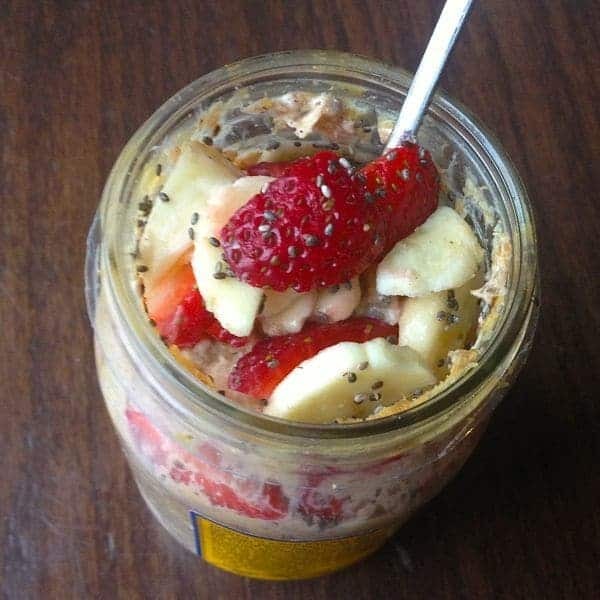 oh this looks yummy, Liz :) I love steel cut oats. I’ll have to try something like this! I do too – they are so good and chewy! I just bought chia seeds for the very first time the other day — now I know what to do with them! YUM. Oooo good! You’ll love them. I sprinkle on everything – oatmeal, cold cereal, smoothies, etc. Great crunch factor. I can not wait for strawberry season! 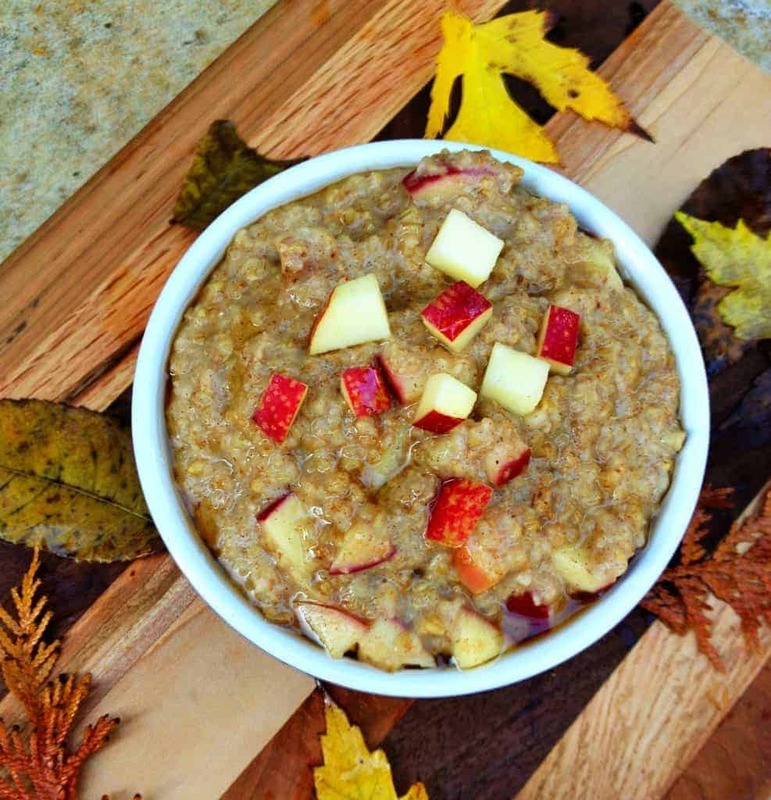 This oatmeal is almost to pretty to eat! Almost. Thank you so much!! I’m addicted to the crunch of the chia! !